Today is a day away from baking, and a day to ski. I really enjoy teaching skiing during the winter. It helps me appreciate cold rainy days. 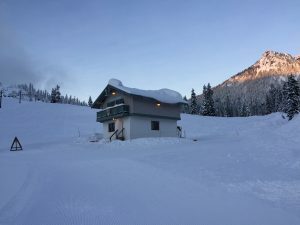 This morning, when we arrived to Cascade Ski School at Snoqualmie Summit, you couldn’t wipe the smile from my face. Every time I arrive to the mountain to ski, it brings a smile to my face. I truly enjoy skiing. But today was even better. It was cold, the sun was out, and the snow was perfect for skiing. It was a “bluebird” day. Some days you just have to get out into this beautiful world God as made. Today was a “Let’s SKI” day.